The Black Wizard Velnor has gone into hiding in the goblin labyrinth beneath Mount Elk. After centuries of searching he has finally discovered the ancient tomb of Grako and is about to realise his ambition, to become a true demon on earth. There is only one hope for mankind, and that’s you, of course. You must penetrate Velnor’s defences, avoiding the traps and surprises before his metamorphosis is complete — but Velnor is a master of illusion. To undertake this text-only adventure you may elect to go in the guise of a wizard, a priest or a warrior. Each has its own characteristics. The wizard is poorly equipped to physical combat, but his powerful magic compensates for lack of strength. He has a polymorph spell which turns any non-magical creature into a frog. The fireball spell can be used (at a distance) to consume any living creature within a specific location, and the teleport spell carries you and anything in your possession from any location to the cave entrance. Spells used drain the wizard’s spell strength. The priest is somewhat better off than the wizard when it comes to combat and he has a number of defensive spells to use, such as a shield, which decreases vulnerability during combat and makes the priest as hard to hit as the warrior. A healing spell can be used after wounding in combat, and there is also one to dispel any undead creature. The warrior is obviously best suited to physical combat, the hardest to hit, and can take the most punishment. He has no spells to use, but may make use of any magic object found during the quest. Combat during the game takes place in rounds where each creature involved is allowed one action, at which point you may continue or flee. There are no graphics in the game, but the border colour alters from white through to black, indicating your state of health. Although the locations and their positions in Velnor’s Lair remain the same from game to game, as do the objects, the living and undead creatures tend to be quite random. 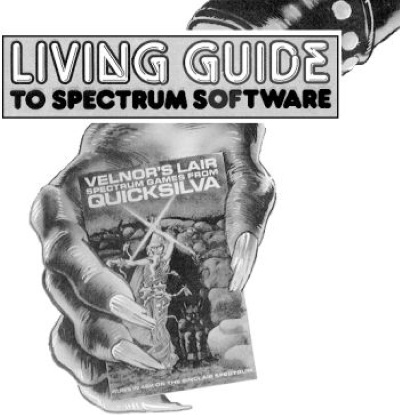 Velnor’s Lair was written some time ago, in BASIC, and therefore suffers from hesitant responses, but this is hardly any deterrent to enjoying what turns into a highly complex and convoluted adventure with plenty of humour. Some quite devious solutions are required to problems — getting through the spore-ridden atmosphere of the passage leading to the Goblin’s lair is a case in point (but did you remember to pick up the silk handkerchief?). Velnor creates a number of illusions which result in sudden death until you get the hang of treating nothing as an absolute until it’s been tested carefully. Velnor’s Lair is definitely one of those games that attract you back for another play, possibly months after your first try, and Derek Brewster has built in enough situations and solutions to make it rewarding. It was originally released under his own company, Neptune, but is now marketed by Quicksilva, price £6.95.